Looking for an awesome side dish? 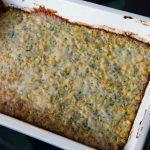 This healthy corn casserole is a must try. I added chia seeds, nutritional yeast and flax seeds to this recipe to make it a high fiber side dish with loads of flavor. The chia seeds are what gives it that speckled look. 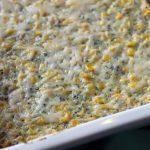 I am always looking for ways to make regular meals more nutritious and did that with this healthy corn casserole. We had friends over when we served this dish and they loved it! That’s how I know it’s a real winner. If your kids are young, try to expose them to as much variety as possible. I love to offer my twins foods with speckles whether green or black for them to get used to foods with a lot of variety. If you’re not familiar with nutritional yeast or chia seeds, check out our article all about superfood add-ins. We walk through the health benefits of each. Once I learned about them, it became my mission to figure out how to add them to almost everything we are eating. Some were hits, and some were definitely misses. This healthy cream casserole recipe was a hit! 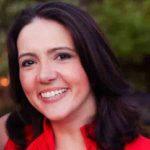 If you have young kids, don’t worry too much if they don’t eagerly eat casseroles. Toddlers are more cautious when trying new foods, especially foods a child can not easily discern. My twins will eagerly eat broccoli, but when it’s a part of a casserole, my twins won’t touch it. That’s why they love deconstructed meals. I just keep offering them the food and with enough exposures, I’m hoping they will try it. A mom can hope. Meanwhile, I’ll be enjoying this casserole with the other adults. Looking for an awesome side dish? This corn casserole recipe is a must try. We've added chia seeds, nutritional yeast and flax seeds to this recipe to make it a high fiber side dish with loads of flavor. 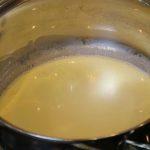 In a medium pot, add the cream, 1/4 cup of milk (only half of the milk), add heavy cream, salt and butter. Take the 2 TBSP of chia seeds and add 5 oz of water. Let them soak for 5-15 minutes to turn into a pudding. In a separate dish, whisk the eggs together until well beaten. In a separate dish, add the flour and remaining 1/4 cup of milk. Mix until well combined. When the milk in the pot comes to a boil, add the almond meal and milk you just mixed to it and wish all together gently for about 30 seconds or so. 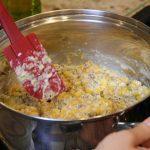 Once combined, remove from heat and add the corn, Chia seeds, nutritional yeast, and flax seeds and mix together. Slowly add the eggs in while mixing everything together. Don't let the eggs curdle. Pour everything in your pre-greased dish and put in the oven for 30 minutes at 400 degrees. Let the dish cool so it can firm up before serving. Next articleLemon Yogurt Healthy Blueberry Muffins with No Added Sugar!